Presentation of the Blessed Virgin Mary – Memorial - My Catholic Life! Stillbirths, infant mortality, and mothers’ dying during labor have been among the most predictable human tragedies since time immemorial. Medical progress has only in recent generations dramatically reduced such deaths, albeit unevenly throughout the world. In light of the real dangers of pregnancy and childbirth, the successful birth of a healthy baby has naturally given rise to ceremonies in many cultures thanking God for the precarious gift of new life. Jewish law required the ritual dedication of first-born sons to God in the Temple. It is probable that a similar custom, if not a law, also called for Jewish girls to be so dedicated to God. It is the likely presentation of the child Mary in such a ceremony that we celebrate today. The Church does not claim that today’s feast is rooted in Sacred Scripture. There is no direct biblical support for Mary’s Presentation except in the apocryphal gospel of Saint James, a problematic text replete with follies. 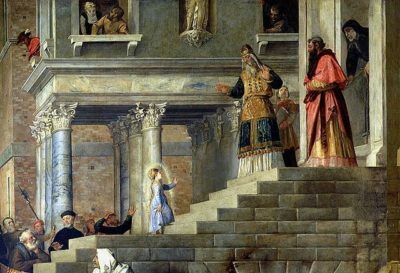 The lack of textual support is, nevertheless, no reason to doubt the ancient tradition, especially preserved in Eastern Orthodoxy, that Joachim and Anne consecrated their daughter, Mary, to God at the age of three in the Jerusalem Temple. The prophet Samuel was similarly presented by his mother, Hannah. Both Anne and Hannah were supposed barren and were thus all the more grateful for the fruit of long-forlorn pregnancies. It is a good and holy thing for Christian parents to proactively dedicate their children to God, to invite their offspring to consider a life consecrated to His service, and for parents to pray and fast that their sons and daughters become priests or religious. While some may consider it an imposition for parents to explicitly so encourage their children, all parents are energetic in promoting in their children some type of conformity with their own religious or quasi-religious beliefs. These “beliefs” may be related to the environment, politics, leisure, arts, sports, etc. Parents always indoctrinate their children. It is intrinsic to their role. The only question is what the content of that doctrine will be. Ideally, Christian parents understand their child as a gift, not as a piece of property or as an object they have a right to possess, and are thus willing to return that gift to its source—to God Himself. The essence of any sacrifice is to burn, kill, or destroy something of value in order to close the yawning gap between God and man. A sacrifice can be in thanksgiving, to repent of a sin, or in petition for a favor. Primitive priests in cultures across the globe stood at their rough stone altars on behalf of their people and offered God fatted calves, heifers, sheep, the finest grain, red wine, and even other human beings. Abraham was willing to offer his very own son to God. Blood sacrifice gradually receded in Judaism, however, to bloodless sacrifice, opening up the higher and more demanding pathways to God of prayer and study. To present a child to God, either in a formal ritual or in a private dedication, is to lay that child on a symbolic altar and to say to God: “You create. We procreate. My child is Your child. Do with this child as You will.” Such humble and antecedent submission to the will of God is not an abdication of the duty to form a child in human and religious virtue. It is just to be realistic. Children are gifts, not metaphorically but actually. No one understands this like the infertile couple. When parents consecrate a child to God, whether at baptism or later, informally, they are manifesting a willingness to return a gift to its remote source, to please the Maker by giving Him what He already possesses, life itself and all who share in it. Saints Anne and Joachim, in gratitude for the gift of life, you presented Mary in the Temple. Help all young parents to see in you a model of dependence on God’s providence. You helped prepare Mary for greatness. May similar consecrations today prepare the Church’s saints for tomorrow.